The NES TR is built on Tridium’s powerful and durable JACE controller utilizing Niagara programming. It is designed to provide optimum functionality and system features, including scalability – custom designed according to customer requirements – and an “open” communications platform that comports with many BMS and/or EMS communication protocols. And it distinguishes itself by its ability to interface with variable frequency drive (VFD) technology to track real-time energy consumption / savings. The NES Tridium JACE controller relies on the Tridium JACE 8000, which operates with Niagara 4, the latest version of the Niagara Framework®, providing optimum performance. It is configurable to serve from 25 devices – CO & NO2 sensors, VFDs, and temperature & humidity sensors – up to 200 devices. 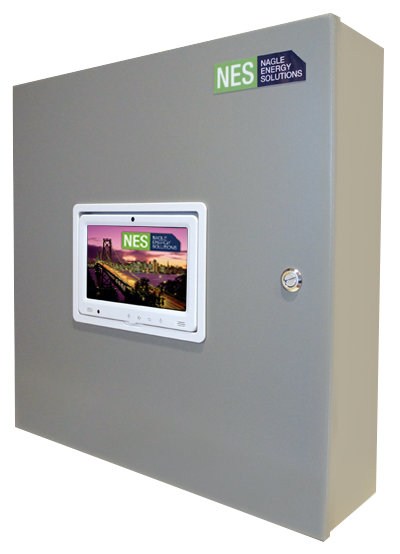 The NES TR controller is Internet accessible via any Internet browser, with an optional, onboard display to facilitate trouble-free commissioning, system adjustments and troubleshooting. The controller is designed to control a single zone or multiple zones, and it can control multiple garage fan motors and VFDs. Compatible with BACnet®, Modbus®, Metasys®, LonWorks® and many other communication protocols. Graphics module provides detailed, real-time views of system component performance. Provides alerts for calibration and replacement of sensors. Provides energy usage and savings reports on screen and emailed. Provides critical alarm notification via emailed notifications. Trending available for all points. Trend trend reports can be generated and saved as a PDF or as an excel document on your PC. Front panel interface to allow power and communications for laptops – when a wireless router is not employed.